Our bins are obtained from a premium UK manufacturer. All our bins are easy to use, have long working lives, are safe, hygienic and presentable. Waste bins (also known as containers) are ideal for businesses that have enough storage space to keep the container off the street. They are the preferred way of collecting rubbish and recycling. Whatever your requirements, we can tailor a solution to suit you with our range of wheeled bins, compactors or baling machines. All it takes for a bin collection agreement to be set up is to contact us. If you have opted for bin collections we would ask you to sign a service agreement which outlines the terms and conditions and level of service. Customers on a service agreement will receive a monthly invoice – it’s best to settle this using Direct Debit. Our bins are also available to hire for residential use. If you are a residential managing agent requiring bins for household waste and recycling, then please contact us. 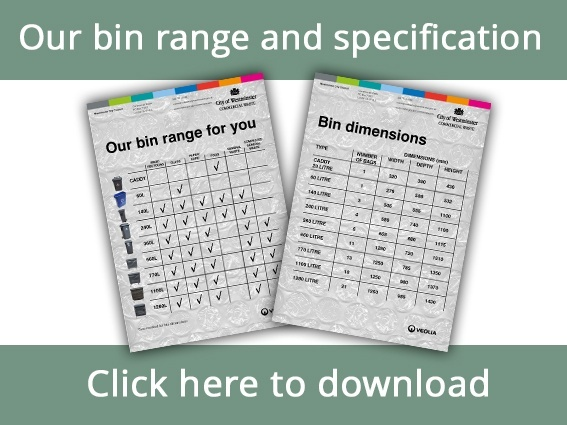 To download all of the information and specifications on our bin range click on the image below.